We love celebrating seasons here at Sugar and Charm and I’ve made it known that my favorite seasons are fall and winter. 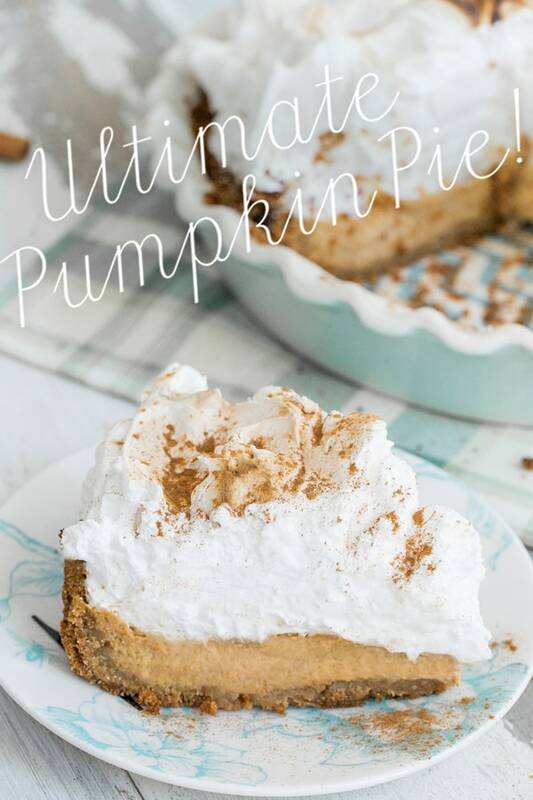 I love all of the activities a new season brings and for fall it means trips to the pumpkin patch, bonfires, pumpkin spice lattes and testing out seasonal recipes. I also enjoy setting the fall mood in my house with small details like switching out hand soaps to fall favorites, incorporating festive colors and charming décor and filling my house with scents of cinnamon, apple, ginger, pumpkin and yummy spices. As my husband can attest to, I have my pumpkin candle burning throughout most of the day, even if it’s 90 degrees out here in Los Angeles! Of course my favorite autumn activity is baking… who would’ve guessed?! I’m all about adding pumpkin into my beloved recipes and testing out new ones to see how I can make them even better. 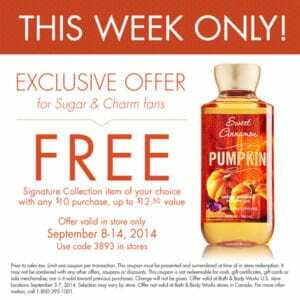 So this week I’m celebrating Pumpkin Week with a recipe inspired by Bath & Body Works’ pumpkin fragrances! 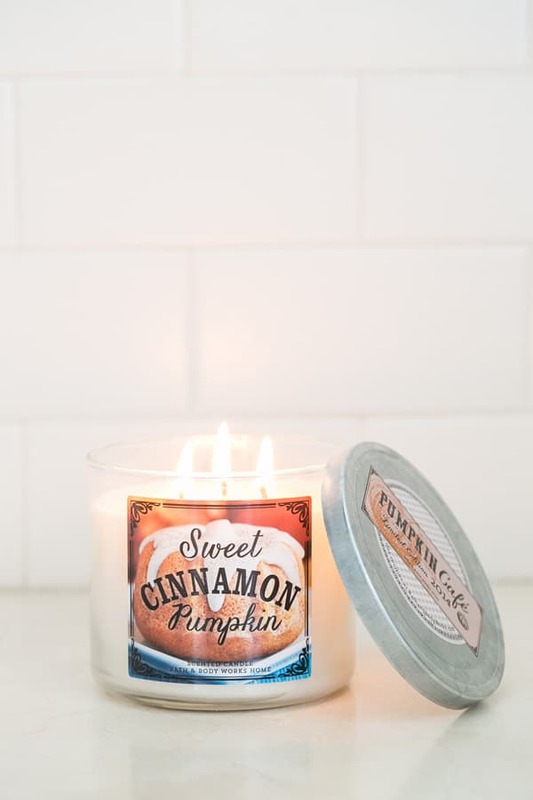 The Sweet Cinnamon Pumpkin fragrance comes in lotions, candles, room spray, shower gel, a fragrance mist and more delicious products you can see here! Also, we have a fun promotion below for a Free Signature collection item of your choice! Combine all of the ingredients into a bowl and mix. Then pour into a pie dish and press down along the bottom and sides of the dish. The crust should be wet enough to hold its place. Bake in a preheated 350 degree oven for 7 minutes. Whip the cream cheese until light and fluffy. Add in the eggs and continue to beat on high, scraping down the sides of the bowl. Continue to beat with the sugar and then add in the pumpkin and the spices. Mix until combines. Pour in the evaporated milk and butter and continue to mix. Pour the pie filling into the crust and bake at 425 degrees for 10 minutes. Turn the oven to 350 degrees, cover the crust with tinfoil so it doesn’t burn and bake for another 20-30 minutes until the center cooked. Let it cool before adding the layer of marshmallow. In an electric mixer with whisk attachment, beat egg whites and cream of tartar together until light and frothy. Slowly add in the two tablespoons sugar and beat until soft peaks form. So fun. 2. In a small saucepan, combine 1/3 cup water, corn syrup and remaining 2/3 cups sugar. Place over medium heat and cook until boiling. Cook and stir until mixture has been boiling for about 6 minutes or until it reaches 242 to 248 degrees on a candy thermometer. Remove from the heat. 3. With the mixer on low, slowly add the syrup mixture to the egg whites. Increase mixture speed to high and continue beating for 5 minutes. Add in the vanilla and beat for another minute until mixture looks like marshmallow cream. 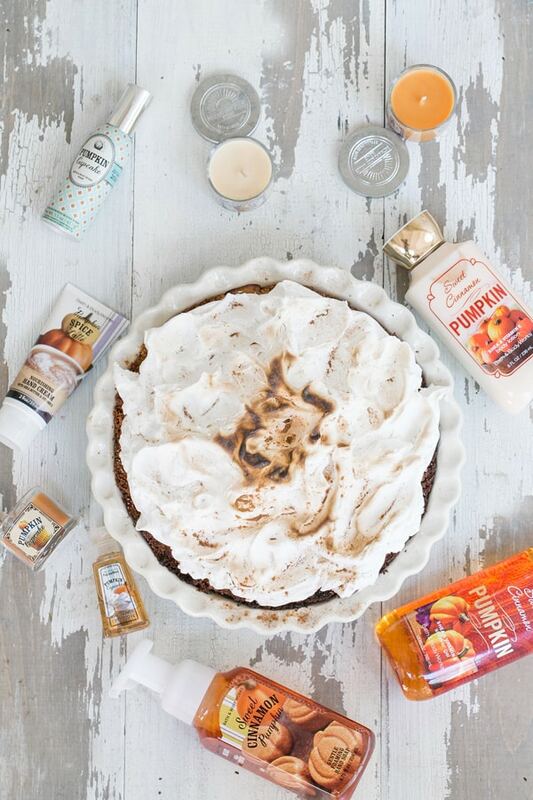 Pile the cooled pumpkin pie with marshmallow fluff! Using a torch or broiler, toast the top of the marshmallow until golden brown. Sprinkle on some cinnamon and enjoy! This post was in collaboration with and sponsored by Bath & Body Works. Oh I love that you used marshmallow fluff for topping! It’s a great twist! And it’s about a mile thick – which I whole heartedly approve of! Haha!! I figured go big or go home with that marshmallow fluff 🙂 Thanks Liz!! Don’t you just love fall baking?! 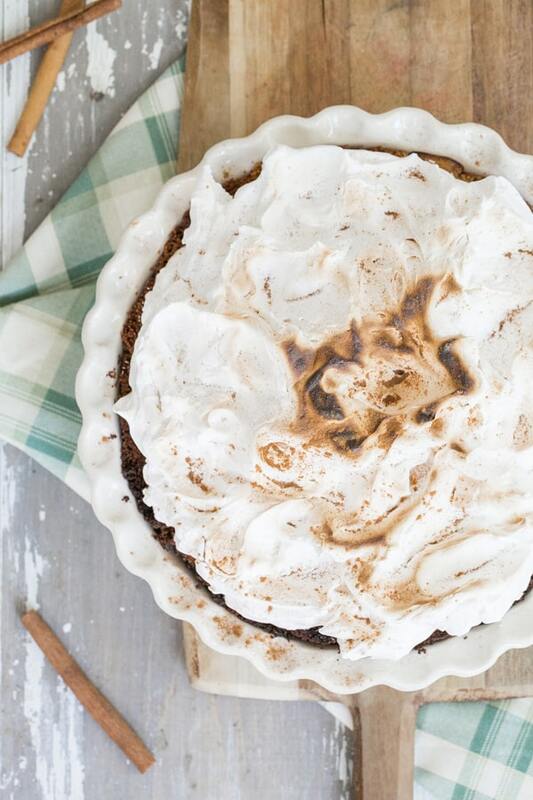 This pie looks great, but I must agree with Liz – the fluffy marshmallow topping is phenomenal! HOMEMADE FLUFF?!?!!? Get outta here! That really is the ultimate pumpkin pie!! I would seriously make this today if I could have dairy! Perfect thanksgiving dessert! 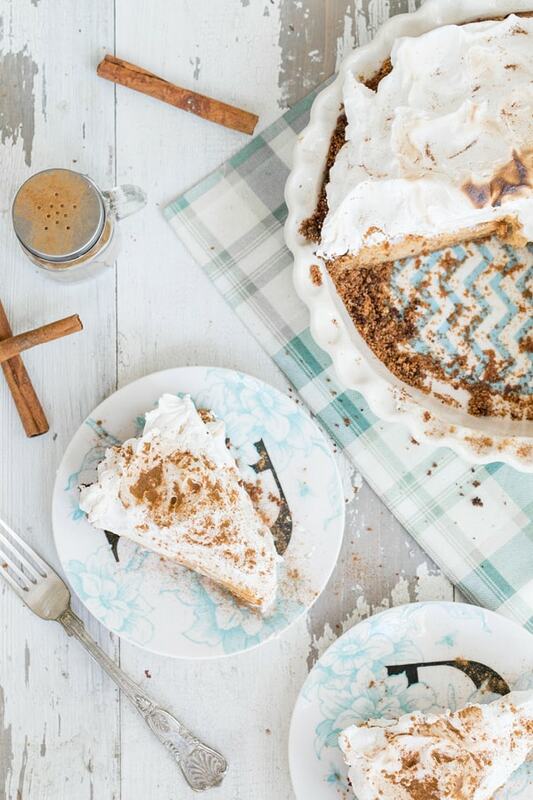 This pumpkin pie looks so incredibly delicious. You could definitely cut me a slice as I am craving one to devour right now.. pinned! I live in Vancouver BC and am not sure what Libby’s pumpkin is as we don’t have that up here. Can you tell me what size can of pumpkin to use~ ml, ounces? Hi Ally! The can of pumpkin I use for this recipe is 15 ounces. It’s just a standard, pure pureed canned pumpkin. Hope that helps! What size evaporated milk can do you use? I am making this to take to a party. How far ahead of time could you make this, if a few hours do you just keep it in the ffridge? Hi Sierra! You can make the pie the day before if you want. Then I would do the marshmallow topping (and toast it) right before you leave for the party. You can actually make the marshmallow fluff before, but don’t toast it until you leave. Hope that helps!! This pie looks absolutely delicious! I am planning to make it for Thanksgiving but had a couple questions… I am not a regular baker so I am a little out of my element. I need to make it a day or two in advance but I’m not sure about reheating it when ready to serve? Do I just follow instructions and stick it in the fridge until ready to serve? Then just warm it in the oven before serving? How long and at what temp would I do this? And would the marshmellow topping be ok in the over? 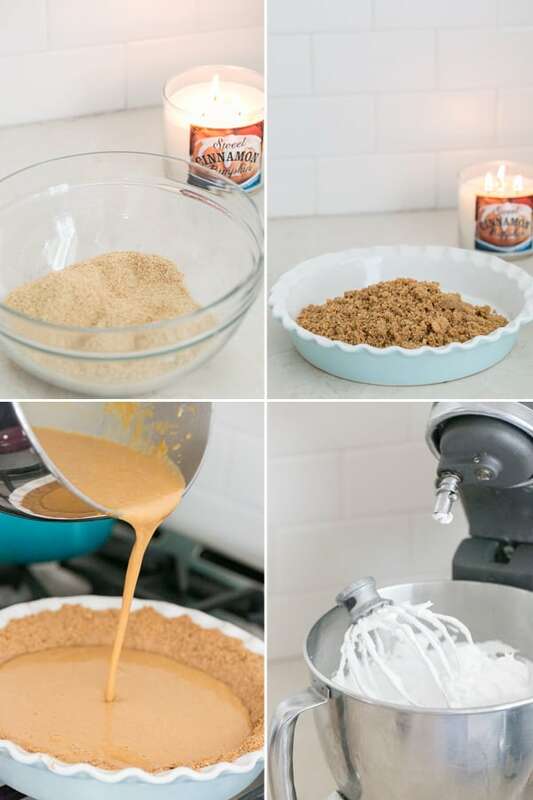 Can you make this pie the day before? Yes you can! I wouldn’t make the marshmallow fluff until the next day though. But the pie is still great even a few days later!